"seeing the Double Cluster in the RB-66 left me feeling weak at the knees and misty eyed"
The RB-66 consists of two compact 6 inch (150 mm) aperture f/5 Newtonian optical tube assemblies supported precisely in parallel within a machined frame, supported by an alt-azimuth platform. The optical tube is an open truss frame work made of aluminum stock finished internally in an anti reflection paint, with a lightweight molded exterior white shell. 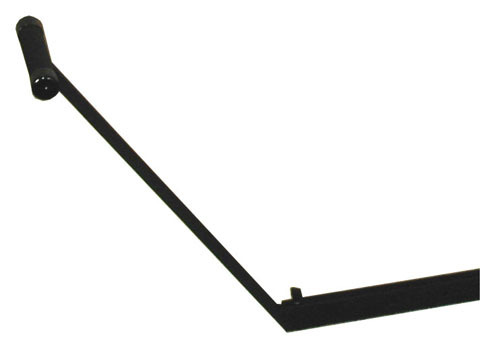 This assembly holds optical collimation well even with temperature or humidity changes. 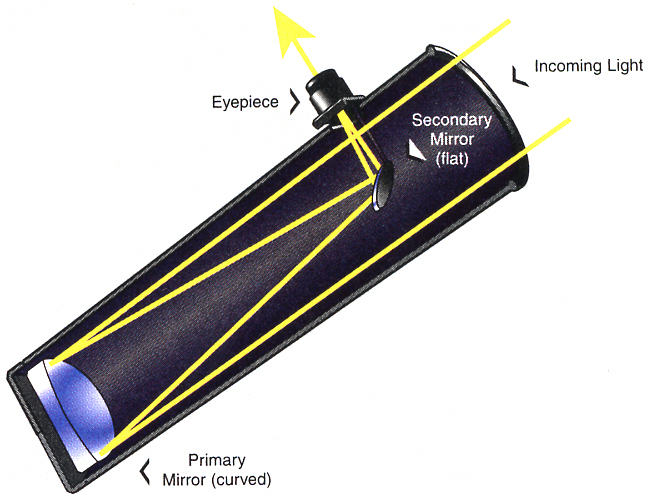 This tube design permits the designer to select a smaller secondary mirror/obstruction than might otherwise be needed. And this keeps the assembly lighter in weights. 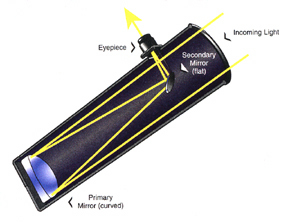 The Primary Mirror of the RB-66 is made of Pyrex® glass. The American firm Corning Incorporated developed Pyrex® a well proven material which has been marketed since 1915. Pyrex® is a sophisticated borosilicate glass composition made of Silicon, Boron, Sodium and Aluminum. It provides good chemical, thermal, mechanical and optical properties. Its density is 2.23 g/cm3. This material can be polished to provide and hold a high quality of view, and provides stability and optical performance better than mirrors in most telescopes sold anywhere near this price range. We have been quite pleased with the performance of these mirrors. 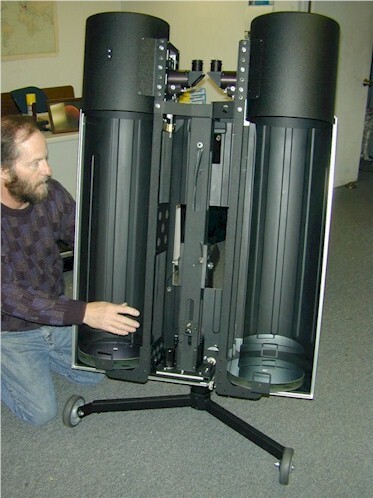 A well made reflecting telescope can offer the best view per the dollar of the faint, deep sky objects where light gathering power is essential. Light gathering power increases are more important and come quicker than one may think; consider that each optical tube of the the 6 inch RB-66 may show objects about 335X fainter than the unaided eye, while each optical tube of the larger RB-10 provides about 900X the light gathering power over the unaided human eye. For serious photon appetites, we also sell the RB-16 which weighs in with about 2,600X the light gathering power over the unaided human eye at each of the two eyepieces - in astronomy size can matter! The RB-66 Reverse Binocular Telescope As we mentioned before, this is not an entirely new concept since it has been around in apertures from 10 inch to greater than 20 inches, and popularized by experienced amateur telescopes makers. However, in the Spring of 2003 with the introduction of the 6 inch f/5 RB-66 JMI became the first manufacturer in the world to make the concept practical, and transportable for the enthusiast. 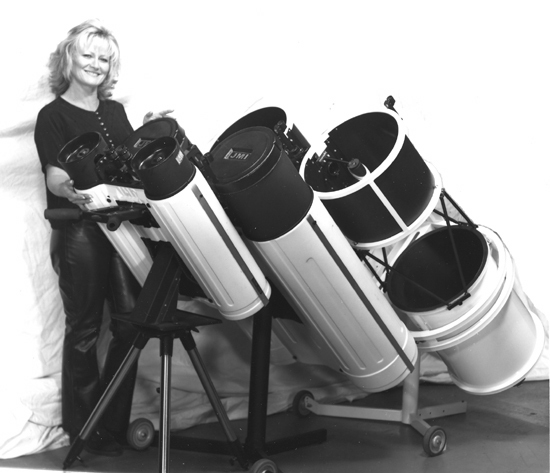 The Reverse Binocular permits an observer to look down into the eyepieces, either while comfortably seated on an observing stool or while standing and see what is in the sky behind you. This is far more comfortable than straining to look up as is the case with a traditional straight through view or inclined angled eyepiece binocular. These RB systems consist of two precisely joined Newtonian telescope optical tube assembly, installed in an alt-az mount creating a very compact and comfortable viewing experience. 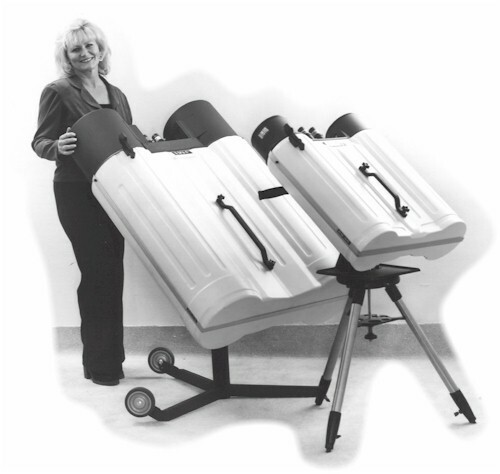 The available models manufactured by JMI are 6" RB-66, the 10" RB-10, and introduced in the spring of 2005 - the 16" RB-16 (U.S. Patent Pending). You may see examples of these if you visit our showroom. 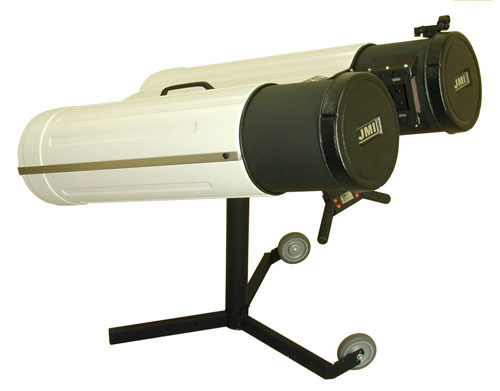 Right: JMI Model RB-66 Reverse Binocular Telescope, viewed from front right (39,671 bytes). Click on image to see an enlarged view. Many other images of the RB-66 are available below. And JMI engineers worked through many prototypes to arrive at a system which is not only user friendly, but in sizes up to the RB-66 and RB-10 are easily managed and transported. The RB-66 Reverse Binocular is provided with an "Alt-Az" or altitude-azimuth moving mount. This mount moves in altitude (up and down) on a horizontal axis, and in azimuth (left and right) on a vertical axis something like a gun turret on a tank. 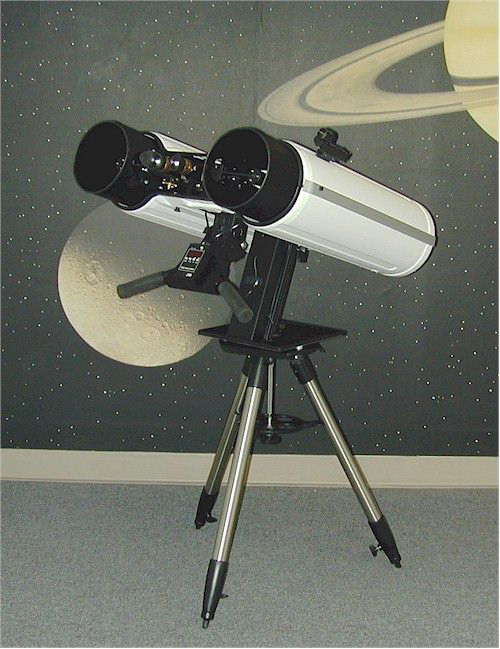 By comparison, an equatorial mount is essentially an alt-az mount that is tilted to match your latitude, allowing a telescope to track the stars with the addition of a simple clock drive Both types of mounts have their advantages Which one is best for a particular situation depends mostly on how one intends to use the telescope. 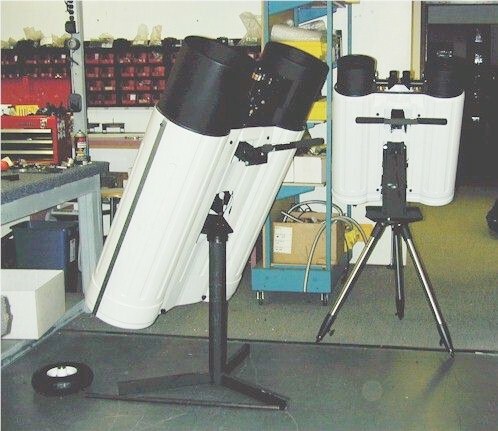 * By customer request, Company Seven can delete and credit the cost of the two provided eyepieces against an upgrade to the superior TeleVue 24mm Panoptic eyepieces. The 24mm Panoptic provide a wider 2 degree true field of view, tack sharp images across the entire field of view even when used of relatively "fast" telescopes as the RB-66, and good observing comfort. The telescope can accept a wide range of 1.25 inch oculars. This RB-66 includes the optional handlebar and wheels for easy transport The final production version will have a modified handlebar that is attached to the end of the tripod leg rather than separate handles attached to the sides of the leg as shown in this picture. This RB-66 has the top cover removed so you can see inside the reverse binocular. The RB-66 includes the optional handlebar (not shown) and wheels for easy transport. The RB-66 prototype (left) is in the final phase of design/construction.